Slowing economy, recovering economy, slowing economy, risk of recession again…. is that we have heard about the USA in recent times. But no matter what shape the economy is in, the USA is a oil driven economy and would come to stand still if it did not get its full share of oil. The funny part is that USA does not produce all of its oil requirements by itself. It is heavily dependent on other countries to provide it the fuel for its economy. Looking at it from the USA’s perspective, the world looks quite different to them. 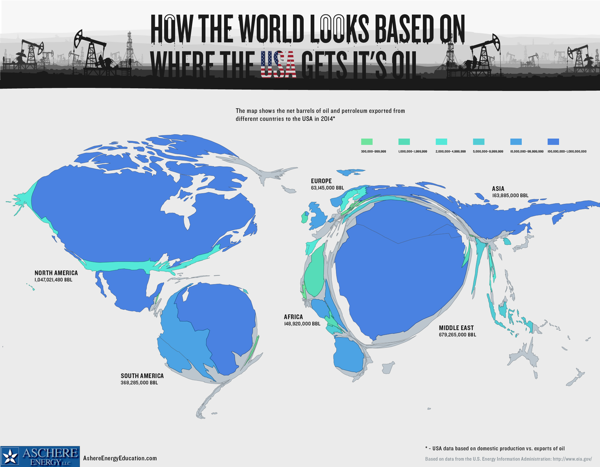 Aschere Energy Education makes an interesting depiction of how the world looks depending on its oil needs and oil suppliers. It is an interesting sight that you must see.